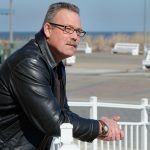 April will mark Victor Letonoff’s 14th year with the Rehoboth Beach Police Department, responsible for what in the winter is a small town and in the summer becomes a big city. The place gets so busy that the department each summer has to augment its force with a temporary crew of younger officers. “What they learn in school is a lot different than what actually happens on the street,” Letonoff says. This wasn’t his first career choice — that was sculptor, which he spent nine years practicing at Johnson Attelier Technical Institute of Sculpture in Mercerville, N.J., followed by five years at a Rehoboth store he opened. It wasn’t his second choice — that was commercial fisherman. But the arrival of his children led him to seek a job with a steadier income and benefits. Letonoff was raised in a military family — his father attended West Point — so, he figured, becoming a cop sort of fit with the family history. During the ensuing years, he has experienced enough to fuel his writer’s hand for years to come — the sleepy winters provide a far different setting in which to police than do the thumping summers, when he has to shift his temperament from responding to a carousel of drunken partygoers to guiding a bevy of seasonal officers. Also in that piece, Letonoff describes the “petite athletic blond woman” he first saw three years later, at a Starbucks “sitting alone banging away on a computer,” and since has married. Her name is Maribeth Fischer, who earned Division fellowships in 2009 (fiction) and 2014 (creative nonfiction). Letonoff has had a longstanding love of writing, and he notes that many people don’t realize how much writing cops do, how detailed and precise they must be. Letonoff is hoping to publish at least two new pieces this year, and the Division’s grant will allow him some writing time that otherwise might have been spent on special duty. Ultimately, he wants to write a collection of essays about being a cop, a perspective that he believes can use another voice in a national conversation that has grown quite busy.